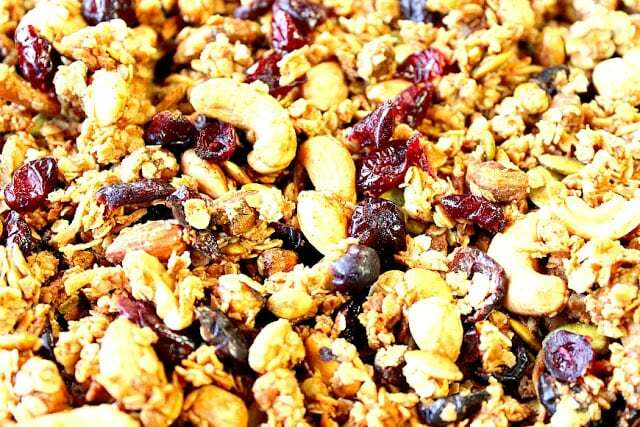 Healthy Delicious Coconut Oil Granola is loaded with healthy nuts, seeds, dried cranberries and oats. It’s the perfect snack for any time you’re craving something delicious and nutritious. I’m a nut for any variety of nut or seed, so when I make granola, I like to pack it full of all my favorites. If you’ve never made your own granola, I’m here to encourage you to do so. Once you see how easy and flavorful it is, you’ll never go back to the store-bought variety. Plus when you make your own you can tailor it to your favorite healthy ingredients, adjust the sodium to your desired level, and say good-bye to all those pesky additives and preservatives. For this granola, I’ve chosen to use raw cashews and almonds because they’re healthier when raw. And because they’ll be roasted in the oven along with the other ingredients, giving them a uniquely sweet and savory flavor roasted flavor. If you choose to use already roasted and salted nuts for this recipe, that’s fine. Just remember to cut back on the amount of salt called for in the recipe. -In a medium microwave safe bowl, heat the coconut oil, maple syrup, salt, cinnamon and coconut sugar to hot, but not boiling. Stir to dissolve the salt and sugar. Set aside. -In a large bowl, mix the oats, cashews, almonds, pistachios, pepitas and coconut. Pour the coconut oil mixture into the oat mixture and stir well to completely combine all the ingredients. -Line 2 baking sheets with parchment paper and spray lightly with baking spay. 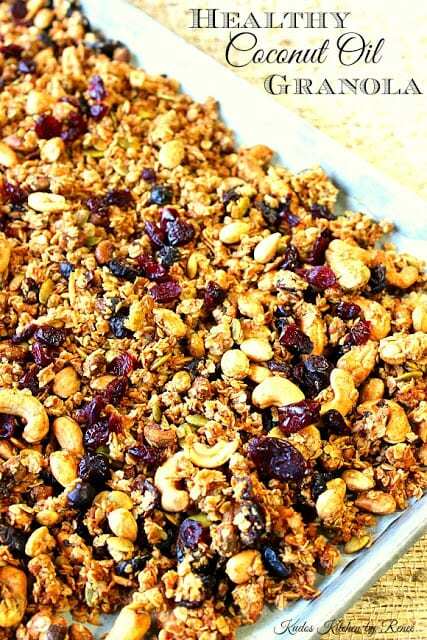 Pour the granola mixture onto the two prepared baking sheets, in an even layer. -Bake for 60 minutes, stirring every 15 minutes to achieve an even brown color. Remove from the oven and cool on a baking rack. Add the dried cranberries and it’s ready for munching! If there is ever anything I can paint for you, from glassware, to aprons, to tea towels, please don’t hesitate to contact me or visit my shop on Etsy. Custom orders are always welcome and always encouraged. Kudos Kitchen by Reneé ~ Where, food, art, and fun collide on a regular basis! I love granola and am so happy it's easy to make gluten free. I only use coconut oil now. And love that yours is also made with unrefined sugars. All the nuts and fruit look so good. I tried to make it as healthy as possible, Katrina. I made it for a friend who is battling illness. Glad you like this recipe. It's one of my favorites too. 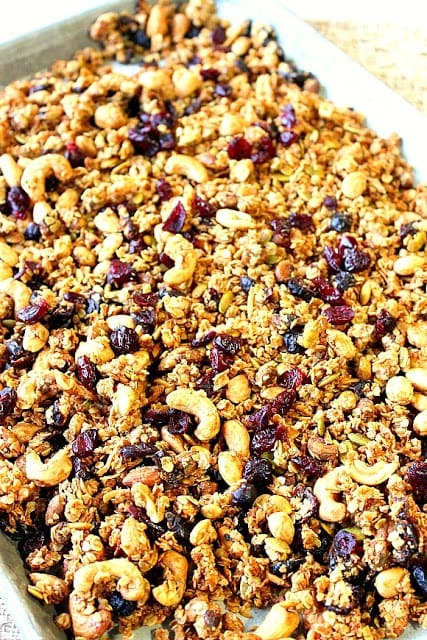 Just pinned this tasty granola! Can't wait to try it! 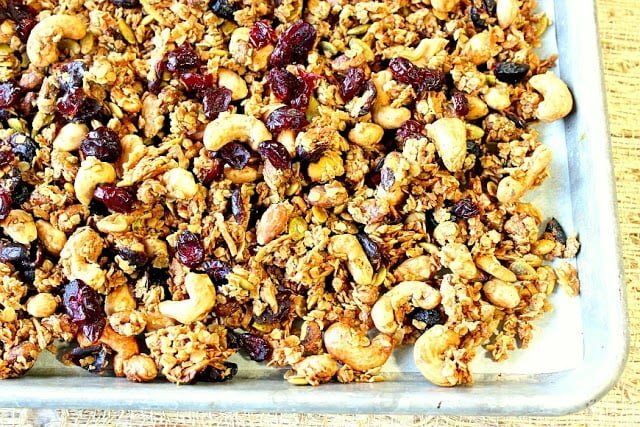 First of all I love granola, second of all I love coconut oil – so this recipe is perfect! Would be great in a parfait for breakfast this morning! I've never made my own granola before! OK, you have convinced me 🙂 This looks amazing! This looks so good! I love homemade granola! I love making homemade granola where i can control the sugar amount. I made a batch of granola today to send in a care package to my son in college. I've used coconut sugar but have no idea why I haven't tried using coconut oil! Great idea and this looks really delicious! 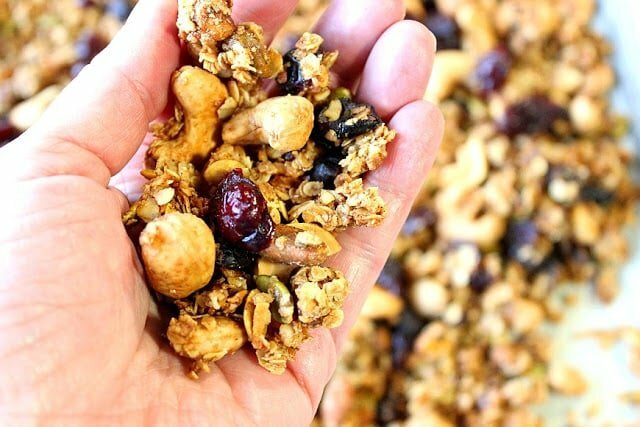 I crave granola almost every morning…but don't always have my homemade version around! 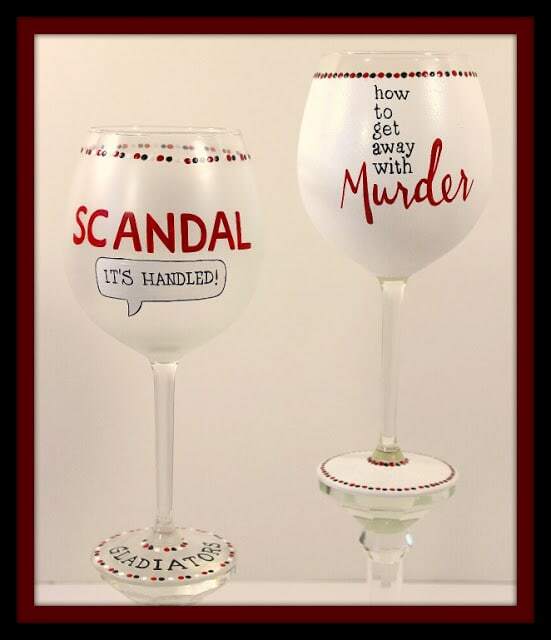 Love that you used raw almonds and cashews and those Scandal glasses are just too cute!! I love homemade granola and try to keep a batch made all the time. I've never made it with coconut oil and don't really know why except that I just don't think to do it. Your recipe sounds fantastic and I'm bookmarking it to try later in the week! This looks like a great snack food for work. healthy and colorful! I adore granola and anything coconut always rocks my world. I can almost smell it. This granola looks terrific! You're right — this certainly is nutritious and delicious! You're using some of my favorite ingredients so I can't wait to try this!